I'm so glad I went to the JCA Shelter yesterday to volunteer by photographing this weeks animals available for adoption. I couldn't have gone out there this morning since it is snowing here and I'm already stuck in my driveway. We currently have more adult cats than we have had for a long time at that shelter. This week we have three dogs including Willis, a young Pit Terrier mix puppy. A litter of kittens that had been in foster care was brought in this week. I photographed our three kittens as they were held by Pam, one of our volunteers. 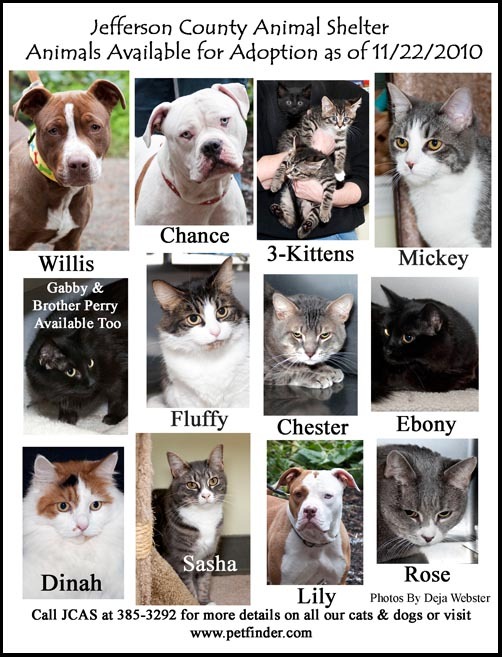 Please give the Jefferson County Animal Shelter at (360) 385-3292 for updates on any of the animals on the adoption poster.